CAMPAIGN LAUNCHED: We are going to South Africa!! This last campaign was for our project at the Botshabelo Orphanage in South Africa. Leela recently traveled to the town of Izalco in El Salvador and helped the Chorro Abajo School establish a photography program. We spent a week teaching the kids and our ambassador the basic of photography and set up the program to run into the future. While there, we also ran a mural program and helped the kids paint a beautiful mural on the walls of the school. Read more about the project on “Our Projects” Page! Playing on their NEW PLAYGROUND!!!! Last sunday the kids at KM played on their new playgrounds for the first time. The boys played in the pouring rain, which had absolutely zero effect on their fun! We had a surreal moment watching the children playing, realizing the project had finally come to fruition. Our playground opening party was complete with yoga, photography, samosas, and of course playing on the new playground! Before going on the playground each child received their own StarSeeds Shanti orange bracelet, they have been a real hit! and last but not least Tracy Kunichika, founder of Operation Shanti. 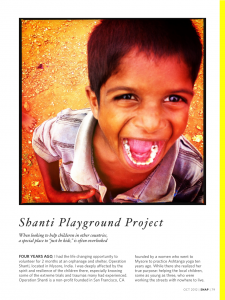 Her inspiring work in India has helped the special children at Operation Shanti and made this project possible. We are also thrilled to announce the photo program will go on after we leave. The kids will be doing monthly photo classes and we will be working with them via skype. Their pictures will posted after each class on a blog for all to see! Girls play for the first time on their playground! Boys first time on their playground! To the kids at Operation Shanti whose spirit has touched us deeply. We are forever connected to you!